Call of Duty 4 is a slot machine from Cryptologic with 5 reels and 25 pay lines. The slot machine is based on the very popular video game that was launched in 2003 and later developed into PC games. This slot machine has one of the coolest bonus features ever to have been included in a slot machine; you are thrown into battle and earn your free spins by shooting the enemies – just like the video game! The whole slot machine is filled with very entertaining clips and special effects from the video game; battle scenes, air strikes and interactive bonus features. There is no doubt that this slot machine will deliver one of the best gaming experiences ever. Imagine having the chance to win a fortune on the reels while playing the interactive video game features. Call of Duty 4 Modern Warfare is one of the latest developments from Cryptologic and it will go to history as one of the most innovative online slot machines ever to have been created. This is nothing for the faint-hearted! Call of Duty from Cryptologic has adapted the graphics and sound from the video game and it’s a thrilling experience. You will be surprised how many grenades and timed bombs that will explode on the reels, and even outside the reels too. There are soldier characters that appear in the gaming window from time to time and setting off bombs and throwing grenades. Call of Duty delivers a great slot experience which is 100% in consistency with the video game theme. Well, you will find a lot of war items spinning on the reels in this slot machine. Among the lower paying symbols you will find items/gear like machine guns, mines, ammunition and hand grenades. The wild symbol is Soldier symbols and it will substitute for all other symbols except the scatter. If the wild substitutes in a winning line, the winnings are doubled. The scatter is the Call of Duty logo. You will activate the bonus / free spin feature if you hit 3 or more scatters on the reels. - Win up to 4 free games for every enemy hit with a bonus prize for headshots. - A five-in-a-row kill-streak awards an airstrike. An airstrike will award up to 5X multiplier on the free games. - Receive bonus prizes for destroying cars and barrels. 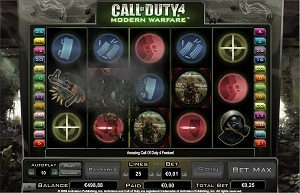 Call of Duty 4 Modern Warfare by Cryptologic has 5 reels and 25 pay lines for you to bet on. The minimum bet per line is 0.01 coins and the maximum bet is 20 coins. You can use an auto play function which is set to your preference by clicking on the Auto play button in the lower left part of the gaming window.